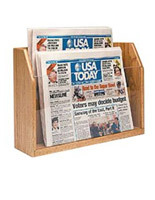 This wooden booklet holder is compact with an attractive light oak finish that is durable and lasting. 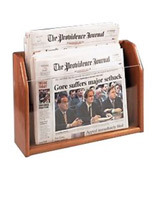 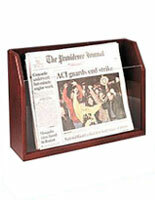 The single pocket acrylic design of this office accessory showcases reading materials for sale, like newsletters or glossies, especially when placed by a register. 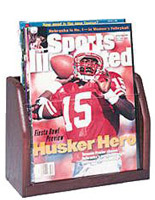 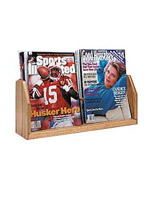 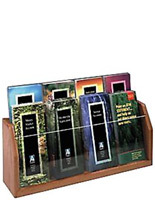 This booklet holder, such as a magazine stand with a clear panel, is priced to sell at this website. 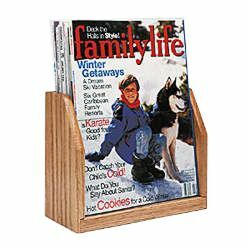 Designed to hold standard letter-head sized periodicals vertically, this desktop fixture leaves room on a countertop for other goods! 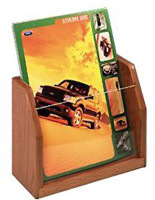 This booklet holder that is a business catalog display can be same-day shipped when in stock!